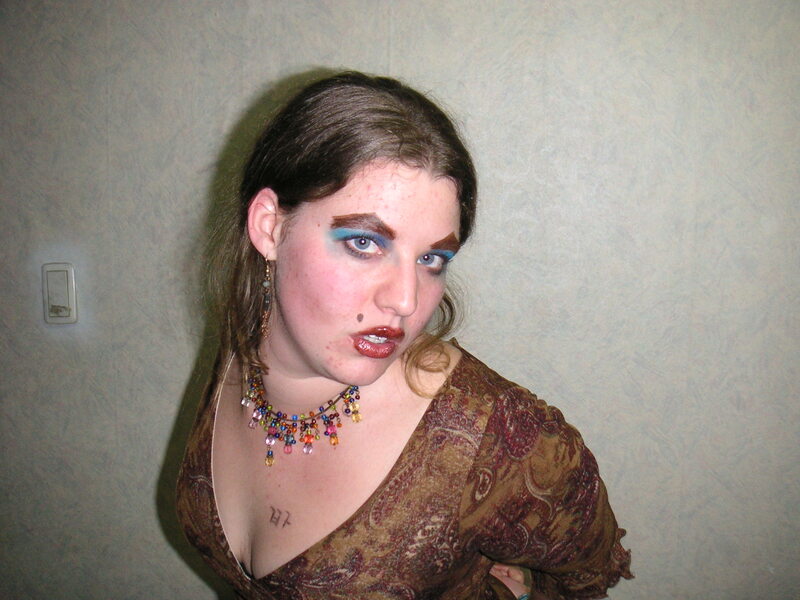 Well, last weekend I went over to Suzie’s house for drunken makeovers! She decided we should make each other look as bad as possible, and well, I ended up looking like a man in drag!! But never fear, my embarrassment knows no bounds, so naturally I have included photographic evidence of this bizarre event for your viewing pleasure! Other than that, Cal has been making himself unpopular again by getting in a big fight with Jenny (it was all a big misunderstanding) but Cal got his pride dented and ended up making Jenny cry. Poor girl has only been director for two weeks and is obviously pretty insecure about her new role, so Cal’s flawless insensitivity made her all upset and worried about doing a crappy job etc. Anyway, I think it’s all just about blown over now, and I said lots of encouraging things like ‘well, he’s a man’ and ‘you’re doing a great job’ etc. I have also extended my culinary expertise (it’s really hard to cook without an oven – everything’s fried or boiled! – and I’m not an inventive cook!). However, Suzie has taught me the secret to great meatballs, which I’m proud to say came out brilliantly, I can now make a pretty good curry, homemade hamburgers, and I even made coronation chicken for lunch today! I have also had a defining moment where I realised that I truly am a real teacher. Olive, our receptionist, sporadically hands out goodies like tippex or highlighters, and the other day I got not only my very own stapler (oh joy of joys!!! It actually had my name on it in permanent marker!!) but a set of gel pens that are scented!!! I was far too excited for my own good, but still spent the whole day teaching my classes that the red pen was strawberry, the black one was grape etc. How truly sad am I? I also had my first adult class on Monday, which I was really nervous about. There were three women, two housewives and a girl about my age just out of Uni. They have different levels of English so it was a bit hard, and most of you know I talk pretty fast, but when I’m nervous I talk even faster!! I was even more freaked out to discover about twenty minutes before class that the textbook hadn’t arrived because the bookstore was out of stock! However, they were really nice, and I started off talking about families (luckily I had brought them pictures of all my family to show them). They even asked me if I would mind taking the class at their houses so that they can cook me lunch!! Well, never turn down a free lunch! That’s about it for this update, so enjoy the pictures!